Strep throat is the outcome of an infection caused by streptococcus bacteria. This bacterial infection makes your throat extremely inflamed and painful. It is usually more common in children between 5 and 15 years of age, but anyone can develop this infection. The bacteria transmit to others through sneezing and coughing. Sharing utensils with someone who is infected will also spread the strep bacteria. What does strep throat look like? Many people explain it differently, but it most often looks like razor blades in your throat. Keep reading to learn more about symptoms and exhibitions of strep throat and how to tell if you have a viral infection or bacterial infection. You will experience certain symptoms when you have strep throat. The most common symptoms are pain while swallowing, red and swollen tonsils which are sometimes covered by streaks of pus or white patches, swollen lymph nodes in your neck, and tiny red spots at the back of the roof of your mouth. You may also have fever coupled with headache. Sometimes a rash may also appear with nausea and vomiting in younger children. It is important to understand that viral infections can also cause these symptoms, so your doctor will test specifically for strep throat for a correct diagnosis. 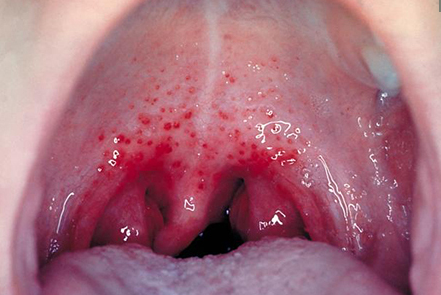 Here is a bit more to answer your question, "What does strep throat look like?" If you notice a prickly coating of tiny red dots on your tongue, the chances are you have strep throat. You will have the same red dots toward the back of your mouth. These dots look more like the outside of a strawberry. You may even develop red spots on the roof of the mouth at the back of your throat. Notice the severity of your throat pain. It is more likely to be strep throat if your experience severe pain that comes suddenly. If you feel better after taking cold liquid or food, the chances are you do not have strep throat because the soreness usually does not go away without prescription medication. Even if your throat is not that sore but you feel pain when you swallow something, this could be a sign of strep throat. You are more likely to have strep throat if you have bad breath, which is caused by streptococcus bacteria. The smell may be quite like metal or hospitals, but some people describe it as rotten meat. Check the lymph nodes in your neck. If they are swollen, the chances are you have strep throat. Simply use your fingertips to feel area in front of your ear. Now, move your fingertips in a circular motion to notice any tenderness and swelling. You will also have swollen lymph nodes under your jaw. Also, use your fingertips to notice any swelling around the collarbone. Noticeable swelling in these areas usually mean you have strep throat. If your tonsils are inflamed, this is another sign that you have strep throat. Your tonsils are more like to look bright red. They will enlarge and have patches of white – these patches can sometimes be yellow instead of white. Some people even notice streaks of white pus on their tonsils. Look for rough rashes which are like sandpaper. They are usually on your chest and neck. Paying attention to these points will answer your question, "What does strep throat look like?" However, you may also pay attention to certain symptoms that you usually have only when you have colds. For instance, you do not usually experience nasal symptoms, such as a runny nose, cough, itchy eyes, or stuffy nose when you have strep throat. Similarly, you may not experience diarrhea if you have strep throat. Your healthcare provider will consider your symptoms and examine your throat to confirm if you have strep throat. They may also ask for a strep test that involves swabbing the throat to see if you have bacterial infection. If the test is positive, you will have to take antibiotics to eliminate the bacteria from your system. Taking antibiotics will help decrease the time it takes for you to recover fully. These antibiotics will also reduce your symptoms, prevent the spread of infection, and keep you from dealing with other serious complications, such as sinus infections, tonsil infections, and acute rheumatic fever. You usually notice improvement in your symptoms within 48 hours of starting antibiotics. Be sure to talk to your doctor if symptoms do not improve after a couple of days. You need take plenty of rest while taking antibiotics and stay home from school, work, or daycare for at least a day to avoid spreading the infection to others. It is important to bear in mind that you should complete the course even if you start feeling better after a few days. Stop taking your antibiotics only when your doctor tells you to. If you stop and start again without talking to your doctor, this may make bacteria resistant to antibiotic treatment. While taking antibiotics, you can also try some natural remedies to accelerate recovery. You need to increase the humidity level in your home by installing a humidifier. Drink plenty of fluids and teas that may contain the herb licorice. This will soothe your irritated throat. Warm tea with honey is especially beneficial for irritated throat. To avoid dealing with all these issues and to keep yourself from asking, "What does strep throat look like?" you should take steps to avoid getting infected. Be sure to wash your hands often and do not share eating utensils like cups or forks with others. Understand that there is no vaccine to prevent this infection, so you need to take precautionary measures to avoid becoming infected.